“What kinds of maps do you use?” AMC Adventure Guide Jerome Val Rios started the session with a question. Girl Scouts from Maine and New Hampshire had traveled to the Highland Center at Crawford Notch to learn outdoor skills. The girls had climbed Mount Willard the day before. Now Val Rios was teaching them how a map could show them where they’d been—and how maps and compasses could guide them on other hikes in the future. The scouts gave Val Rios examples of maps they used—road maps, trail maps, weather maps. Val Rios passed around topographic maps—topo maps for short—of the area around the Highland Center. He pointed out “clues” on the maps: a symbols key, scale, contour intervals, and declination—the difference between true north and the “magnetic north” pointed to by a compass needle. Each of these clues could be used to help the girls connect the real-life landscape around them to the two-dimensional landscape on the map. Val Rios gave the girls a scenario: Having hiked Mount Willard, they now wanted to hike up nearby Mount Avalon. What could they learn about the hike from the map? Would it be shorter or longer than their hike to Mount Willard? How would the hike be different? The girls spread out their maps and studied them. They measured each trail and determined that the trail to the summit of Mount Avalon was slightly longer (1.8 miles each way) than the trail up Mount Willard (1.6 miles). They noticed that both trails ascended west-facing ridges to their respective summits. Looking at contour lines, they could tell that the summit of Mount Avalon (3,442 feet) was nearly 600 feet higher than that of Mount Willard. And because the contour lines for the final approach to the summit of Mount Avalon were closer together than those to Mount Willard, they guessed that it was a steeper approach. They confirmed their guess by counting contour intervals: The last half-mile to the summit of Mount Avalon gained 800 feet, while the final half-mile to Mount Willard’s summit gained only about 300 feet. Their assessment: The hike up Mount Avalon would be slightly longer and harder than the hike up Mount Willard. Val Rios then introduced compasses. Compasses were invented by the ancient Chinese and have been used for navigation for nearly one thousand years. The basic technology has not changed: A magnetized needle points toward the magnetic north pole, located near but not at the true north pole. The difference between the magnetic and true north poles is described in terms of an angle called the declination. In the White Mountains, the declination is 16 degrees W. This means, Val Rios explained, that to travel due East, or 90 degrees, they would need to set their bearings at 74 degrees. One of the girls showed how her cell phone could be put into “compass” mode. Global positioning devices and other digital technologies offer additional ways for hikers to determine where they are, but it is still important to practice map-and-compass skills that have changed little over one thousand years. 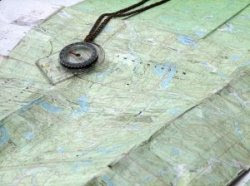 And because the newer technologies can fail (dead batteries, no satellite coverage, false readings), Val Rios and other outdoor educators strongly recommend using compasses and maps to back up and confirm digitally-based readings. Val Rios has put his own map and compass skills to work on long wilderness trips. Some of those trips have taken him to areas of the world, such as Patagonia, where maps are still incomplete. “You really have to watch where you are,” he says. He offers the following suggestions to parents who want to encourage their children to develop these time-tested skills. · Practice. At the end of his classes, Val Rios likes to take kids outside to take bearings. He asks them to see if they can come up with the same bearings on the map and from a landmark. It’s nearly impossible to get the same readings—but practice helps. · Play games. Val Rios sometimes gives kids a series of bearings to follow for 10 paces—say, 90 degrees, 180 degrees, 270 degrees, and 360 degrees—and asks them to tell him what shape they create. (A square.) Such games help kids become familiar with using a compass. · Pay attention. Teach children to notice what’s around them as they hike. Stream crossings, trail intersections, and other markers help you figure out where you are. It’s also important to pay attention to things that aren’t on a map, such as what time it is. Even where the sun is in the sky can be a simple but effective guide. On their imaginary trip to Mount Avalon, the Girl Scouts knew that if the sun was setting behind them as they hiked out, they were heading in the right direction. “Great Kids, Great Outdoors” is an AMC Outdoors blog, written by Kristen Laine and Heather Stephenson. Kristen wrote this post.